In May 2018 I was invited to participate in The Green Hub Festival at University of Tezpur, Assam. We arrived close to midnight at the campus after a 4-hour-drive from Guwahati. And it was amazing. I immediately fell in love with this place – it was still lively, the students roamed around on bicycles – no scooters or motorbikes are allowed, the „activists“ trump the politics – it clearly had more than just a JNU touch. And I saw many, many girls. As I learnt later, Tezpur University is the only university in India which has a place in the top 100 in the world. It ranks #99 of all emerging countries according to Times Magazine and it shares its rank with an university in Russia. The next morning was the opening of the festival. Some of the students performed “We are the world, we are the children” …. (Michael Jackson) – a great start for three packed days with short documentaries to safe and secure the environment in the NorthEast. The Green Hub was set up in Tezpur, Assam, as a one-of-its-kind institution to tell visual stories of the people of the north-east. Every year, 20 youths from across the eight states of the north-east are selected for a unique fellowship at the Green Hub—to learn video documentation, especially focused on wildlife, environment and biodiversity. I was truly amazed by the quality of videos (content, story, editing) I came to see. The fellows were deeply involved in the diversity of the Northeast communities and therefore capable of showing and documenting the possibilities and challenges of the people living there! If you wanna learn about the NorthEast, go and watch their videos! The more I learnt during the festival, the clearer I became in my mind that we need to show these videos as well in Janwaar. Simply because we face quite similiar issues – especially such as human-animal conflict, forest clearings and waste. So I simply asked Rita if a few fellows could come to Janwaar and screen the videos and discuss the topics with the kids and villagers. And this is what we did only two months later. Four of the Green Hub Fellows – Promod, Sherap, Sunil and Tunu – went on the long journey from Guwahati to Janwaar. Their train was a day late but the minute they arrived they were fully engaged and the interactions with the kids started. It was the first time we were using our video equipment for “public screenings” – and it went so well !!! One of the most interesting screenings and discussions we had was on a documentary on waste – it was about Sikkim and how they manage to keep Sikkim clean and free of plastics. It talked about understanding the sources of plastic waste generation, proper collection of waste and finally re-using the waste as much as possible. To reduce the plastic waste they have introduced strong policies such as banning the use of plastic bottles, installing filtered drinking water tanks for communities, and dust bins. 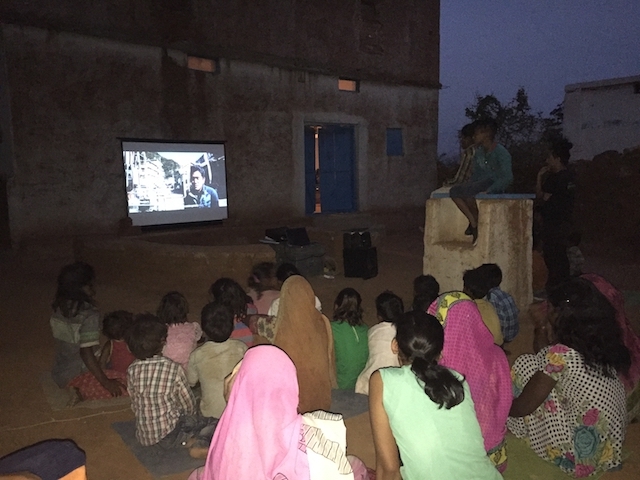 The documentaries made the kids think about the waste problem in their own village. Waste, has always been a topic of discussion between the changemakers and us. And we hope that this documentary took the discussion one step forward where the kids (especially the elder ones) could see solutions at work. The screenings were an experiment which went fairly well and we all hope that we can make this an annual event in Janwaar. Our kids are eager to see and learn more – and we hope that it was a good interactions for the young filmmakers as well. Thank you Promod, Sherap, Sunil and Tunu! 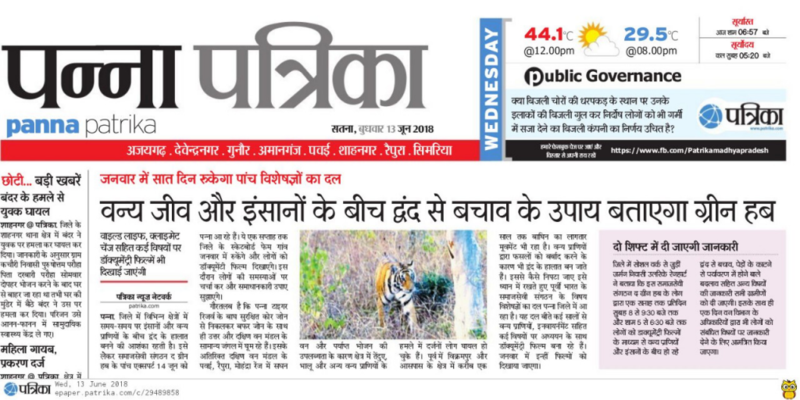 Here are two articles by Shashikant Mishra in our local newspaper in Panna about the event.